When the battered body of a teenage girl is found in a dumpster, Lieutenant Jo Riskin is called to take the case. Investigating with her partner, Detective Lynae Parker, Jo uncovers secrets, loyalties, and ambitions that give motives to a surprising number of suspects , including a boyfriend from the wrong side of the tracks. While immersed in her current case, Jo is battling her own personal demons. After two years, she is still grieving over the loss of her husband, who was killed in the line of duty. New information that could help solve his murder, and let her move on with her life, is within her grasp. 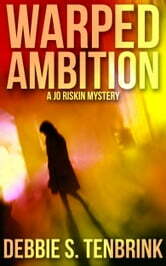 Barricading her heart, Jo is determined to solve both cases and bring the killers to justice.